Exploratory testing is basically Black Box testing, we do not need to worry about internal coding of the software while performing the Exploratory Testing. In simple word Exploratory Testing is all about simultaneously Learning, Test Design and Test Execution. Means here tester first learn about the software then write the test cases or test scenario for it and then execution of those written scenarios all this at on the fly. And this learning about the software needs not to be in sequence. Means tester may choose any feature any module and start learning about it. Tester has the freedom to do whatever he wants; this testing totally depends on the tester creativity, thinking and domain knowledge of the Tester. Why do we calls exploratory testing is depends on tester creativity and thinking? so if you have these question in your mind then the answer is , in Exploratory testing we do not write test cases in advance here tester learn about the features and about the module , write the test cases for it. So it totally depends on how much skilled and quick learner tester are. Where as in other type of testing they write the test cases in advance then they just execute it on the software which is we can called it non – thinking activity just need to follow the steps written in the test cases. Clients always want to launch their software in market as early as possible. So development and testing team have very tough dead line which some time is not achievable by following the normal way. And many times development team does not complete their work in time, so it will leave very less time to testing than planned. At such a situation testing team need to re plan their task without compromising with the quality of the software by using the Exploratory testing the testing may get completed on required time. Let’s take an example: let’s say we are performing the exploratory testing and the application is ecommerce site and we know the common modules of ecommerce site are login module, searching module, add to cart module, payment module and many more. The general flow of the ecommerce site is as shown below. 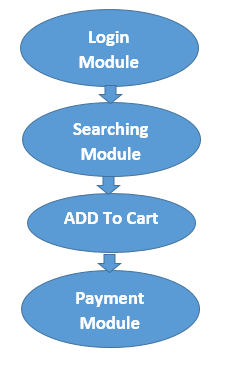 This is generalizing flow of the ecommerce site, there are many more module than shown in image this is just for example purpose. As a normal approach, tester first get the software documents based that, they read it and write the test cases for every scenarios. Which will takes lots of time and this not feasible when we are dealing with very tight dead line. 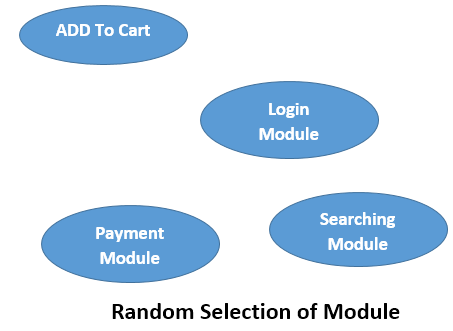 The Exploratory approach for this site will be like this tester first select any module it may be a login module , payment module or any other that is again depends on testers thinking, he may check high priority module first or may select module which have high error chances. Tester will select random module and then start learning about it, once he get the working knowledge about the software then he writes test scenarios or test cases and execute it on software. Exploratory testing requires less preparation. Help to find major bugs early as testers main focus is on the core and error causing functionality. This testing type is suitable when testing time less. Learning to use the application or software system is a challenge. Replication of failure is difficult. Don't know when to stop the testing as exploratory testing has definite test cases to execute. Only possible when you have skilled and domain specified testing team.